From November 2nd - 4th bring your unwanted equipment to any one of 11 locations across Beaufort County for FREE disposal during the first ever CLEAN MARINE EVENT! 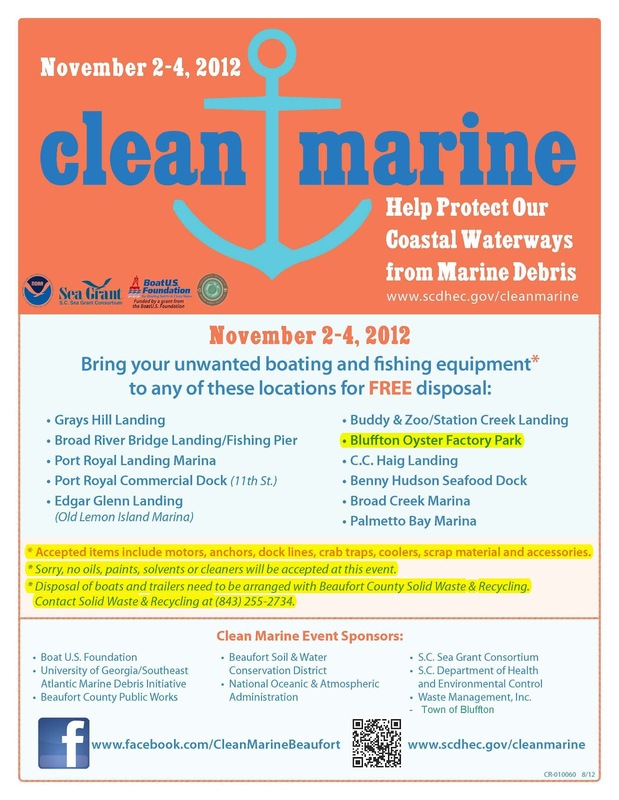 The Clean Marine Event is intended to help prevent boating and fishing equipment from becoming derelict or discarded into our coastal waterways and marshes. Each year, abandoned boats, old fishing gear, discarded equipment and building materials become marine debris that threatens the health and safety of our coastal environment. We need to work together to dispose of unused equipment properly before it damages the marsh, shellfish beds, and endangers people and marine life. This event is funded and sponsored through a partnership with state and local coastal resource agencies, organizations, the marine industry and local municipalities in Beaufort County, with local volunteers from USCB’s student Environmental Organization. Visit www.facebook.com/CleanMarineBeaufort for more information. Sunday, November 4 from 9:00 a.m. to 4:00 p.m.